quick read | Stand Up and Speak Out! 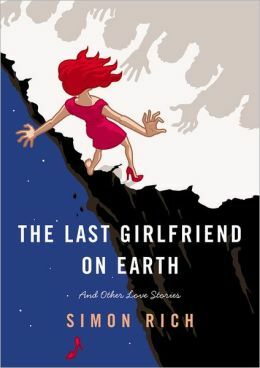 I just finished a short story collection titled The Last Girlfriend on Earth and Other Love Stories by Simon Rich. It was a quick read; 24 hours didn’t even pass between the time I picked it up and the time I put it down. The stories were quirky and most were hilarious. The first one got me right laughing out loud on the airplane while I was sandwiched in between two older men. Once you figure out who the narrator is for that one, you won’t stop laughing (I’m not going to spoil it for you here). The next few stories that followed were okay, but the ones that got me were a little further in. There’s one where Seth meets his ex’s new boyfriend, Adolf Hitler, one where God’s girlfriend demands attention while he’s trying to create the universe on schedule, and one where a priest is asked to exorcise the ghost of an ex-girlfriend from an apartment, just to name a few. There are 31 stories in all, most of them funny, though one of them was sad (thankfully the collection didn’t end on this story or my feelings might have turned out differently). It’s difficult to put into words exactly why this collection was so good; I think the best thing I can say about it is that Rich has a way of thinking of situations, turning them on their heads, and making the best out of said situation. This collection is a must-read for anyone who’s ever been in a relationship.